Roy Fredericks did not look much like a Test match cricketer, and even less like an opening batsman. He was around 5 feet 5 inches in height and his fighting weight was no more than 10 stone. It would be fair to say that from a casual glance he looked rather more suited to the other sport at which he reached international level – he played table tennis for Guyana. As a cricketer Fredericks had a slow start, making his First Class bow in March 1964 at the age of 21. It was three years later he was noticed, but even then only as a result of being called up as a late replacement. Twin centuries against Barbados on a beautiful wicket at home in Guyana paved the way for a rapid rise in the pecking order, although in terms of a measure of quality an innings of 57 against Colin Cowdrey’s England a year later was probably more significant. Guyana were badly beaten by the tourists, dismissed for just 160 in their second innings with no one other than Fredericks contributing more than 19. The West Indies had tried four different openers in the Test series against Cowdrey’s men, the most successful of whom, Seymour Nurse, was by choice a middle-order man. So an innings that Wisden described as resolute was enough to get Fredericks a place in the touring party to Australia and New Zealand in 1968/69. Success at cricket, like all sports, has an element of chance. Fredericks was not originally selected to play in the match where he got his twin hundreds, the chosen openers being Joe Solomon and Steve Camacho. There was a late withdrawal by Camacho due to illness, and the selectors decided to go for a promising youngster instead. They picked a nephew of Rohan Kanhai, 20 year old Romain Etwaroo, the eldset of four brothers all of whom were fine cricketers. The problem was that they couldn’t get hold of Etwaroo who, without knowing he was required, went back to Berbice to go to work. So Etwaroo missed his chance to shine, and after that went to University in the USA, so it was seven long years before he did finally make his debut for Guyana – he got a century then, so was clearly a class act, and if he had known he was required that day at the end of February 1967, perhaps it would have been Romain Etwaroo, rather than Roy Fredericks, who went on to play in 59 Test matches for West Indies. The Fredericks who arrived in Australia was still of the same mind set that blunted the MCC. He made his debut in the second Test and scored 76 and 47, his best scores of the series. In respect of his first innings top score Wisden noted that he batted right through the first day … and he showed the guts that the others so significantly lacked. With a debut century in sight he was out first thing the following morning. He had batted for 281 minutes. Twice on the tour he was struck on the head by Australia’s quicks, Graham McKenzie forcing him to briefly retire hurt at Perth. He didn’t even leave the pitch at the SCG when Alan Connolly repeated the treatment. Australia nicknamed him Cement Head after that, a name his teammates rather liked, and from then on he wasn’t just Freddo, he was Kid Cement as well. West Indies came to England for the first half of the 1969 summer. On a disappointing trip for them Fredericks was the only batsman to exceed 1,000 runs. Two years later Glamorgan were looking to recruit an overseas player and on Jeff Stollmeyer’s recommendation they went for Fredericks, who played for the county for the next three summers. On debut against a Nottinghamshire side led by Garry Sobers he scored 66 and 145*. He also took five wickets in the match. Like Sobers Fredericks was an occasional practitioner of the dark art of left arm wrist spin. In the days when I used to scour the Playfair Cricket Annual for the letters SLC by a bowlers name, and longed to see it bowled, they were the only two, but I never saw Fredericks bowl, nor indeed Sobers other than as a seamer. Fredericks himself always believed that his stint in the county game was the turning point of his career. Up until then he had not watched the ball so carefully, but the late movement that English conditions often encouraged meant that he had to up his concentration. His record for Glamorgan was inconsistent, at one point he was even dropped, but the disappointments were punctuated by plenty of rousing innings, and his popularity with the county’s supporters never dimmed. Altogether for Glamorgan he scored almost 3,000 runs at an average of 41.54. His highest score for them was an unbeaten 228 against Northamptonshire in 1972. In five hours he hit 3 sixes and 32 fours, and with opening partner Alan Jones put on 330, then a record for the Welsh county for any wicket. That innings should have graced a famous victory, but in fact did not, Glamorgan’s last seven second innings wickets collapsing for just seven runs to give Northants the win. By the time of their 1973 visit to England, under the captaincy of Rohan Kanhai, West Indies were a side who were on the way back up. They won the three match series 2-0, to bring about the end of Ray Illingworth’s time as England captain. But they might well have lost the second Test had it not been for an innings of 150 from Fredericks. He was patience itself as he batted for more than eight hours to ensure that his side took their lead into the final Test. The following year in the Caribbean, when Mike Denness’ side secured an unexpected share of the series, Fredericks was consistency itself. He failed to get a century, but still averaged 66. The following year, in India, he was exactly the opposite. There were two centuries, but an average of only 40. Like many openers he was not always particularly happy against spin, and in Erapelli Prasanna, Bishen Bedi and Bhagwat Chandrasekhar India had three of the finest there have been, but Fredericks worked hard and at the end of the series if he could not quite claim to have mastered the great triumverate, he had certainly come out of his encounter with them with his reputation enhanced. 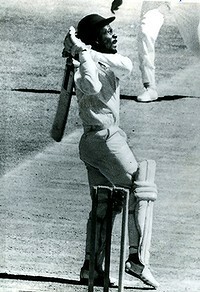 In 1975 cricket had its first World Cup, and the resurgent West Indies swept to victory, beating Australia in the final. Fredericks role in the tournament was not a major one, but his innings in the final, despite amounting to just 7 runs in total, is an abiding memory of the match. Lillee bounced Fredericks who, never one to shirk a challenge, got inside the line and hooked the ball with such ferocity that it ended up on its way to Paddington station. However as the TV commentators rather harshly reminded him he should have put his studs in. When he hooked Fredericks was the classic example of a man who threw everything, including the kitchen sink, at the shot, and on this occasion the momentum was such that he could not avoid treading on his wicket as he completed his follow through. After their World Cup triumph West Indies next international action was in Australia in 1975/76. It was a humbling experience. Lloyd’s men were beaten 5-1 with such ease that a few weeks afterwards Tony Greig made his infamous “grovel” comment. For the West Indians the only high point of the series was the second Test at Perth, then the fastest surface in world cricket. This was their one victory and, on the second day, Fredericks played what former Australian skipper Lindsay Hassett considered to be the best innings he ever saw played in Australia. The first day of the match was taken up with Australia scoring 317-7. Ian Chappell, who had by now passed the captaincy on to brother Greg, batted for all but the first two deliveries of the day for an unbeaten 148. No one else made a half century for Australia. Next morning Chappell went on to 156 and his side to 329 before he was bowled by Michael Holding. Without further addition the last two wickets went the same way. In the previous Test at Brisbane Fredericks had opened the West Indies innings with Gordon Greenidge, but the 24 year old had recorded a pair. Greenidge, who completed his “pair” in the last over of the day was not entirely happy with Fredericks, who could have walked a single off the last ball of the penultimate over but was so cross with himself for failing to send a half volley to the boundary that he stayed in his crease staring at his bat rather than think about running. The pair would go on to forge a solid partnership over the next couple of years but for now Greenidge was dropped and replaced by Bernard Julien, an all rounder with virtually no experience of opening. Perhaps that background affected Fredericks that day. He may have felt, on reflection, that he had let his young partner down at the ‘Gabba, but whatever his motivation he certainly came out of the traps with all guns blazing. Frank Tyson described the start of the West Indies reply; Lillee began the Australian attack in a grim fury with the breeze at his back …. his second delivery was a bouncer and the challenge was immediately accepted by the tiny Fredericks. His red cap flashed inside the line of the ball and the hook shone like a sword being drawn from its scabbard. The resultant top edge soared high above the sight-screen for six. As was only to be expected Lillee, on his home ground, accepted the challenge, Tyson observing that he generated so much pace that at times the ball forced its way through the clasped gloves of Marsh. As for Fredericks Tyson described him as having a policy of attack, attack, attack, all of the time. Lillee doubtless thought he was being given an opportunity by the extravagant shots that Fredericks was playing but, that first slightly misjudged hook apart, Fredericks looked completely secure and raced to 50 from just 33 deliveries. Lillee’s first five overs (eight balls to the over in Australia in those days) went for 35 and then he was taken off to be replaced by Jeff Thomson. With the breeze now at his back Thommo was even quicker than Lillee, at one point producing what was for years recorded as the game’s fastest delivery, at 99.68 miles per hour. But it made no difference. After his first three overs Thommo made Lillee look economical – they went for 33. Julien went with the total on 91, after contributing a rather sketchy 25, but the 100 came up after just 70 minutes in the twelfth over. At least Chappell had five front line bowlers at his disposal, and left arm seamer Gary Gilmour provided a change of diet for Fredericks. The switch altered nothing though, Tyson commenting that Fredericks exploded against Gilmour in a flurry of pulls and slashes off the back foot. At lunch, fourteen overs into the innings, it was 130-1 with Fredericks 81 not out. After the interval Max Walker brought a steadying influence to bear from one end, but at the other Thommo couldn’t contain Fredericks and neither could Gilmour. The century was inevitable, and came in 76 minutes off 71 deliveries. There were as many as 18 fours to go with the six that got Fredericks off the mark. At one point 22 came off a Gilmour over. For some reason Lillee was not given the ball in the afternoon session, which West Indies ended on 258-2, with Fredericks on 169. It was probably something to do with Lillee’s spending the first session repeatedly ignoring his skipper’s plea to keep the ball up. Lillee wasn’t alone in that failing though and doubtless Chappell later wished he had brought him back earlier, as with his first delivery after tea Lillee ended Fredericks’ masterpiece, having him caught by the skipper himself at second slip. If Australia thought the carnage might be over they were to be disappointed as Lloyd, dropped by Lillee off Mallett before he had scored, then helped himself to 149. Lloyd’s innings rattled along at a scoring rate of 80, the same as Stan McCabe managed when he famously put to the sword the Bodyline attack of Harold Larwood and Bill Voce forty years previously, an innings to which many compared Fredericks’ 169. Statistically though there was no comparison – fredericks innings rattled along at a rate of 116. To put those figures further in context Ian Botham’s pyrotechnics at Headingley in 1981 came at a rate of fractionally over 100 – and Fredericks was opening the batting against the two fastest bowlers in the world, on the fastest pitch in the world, and with his side 1-0 down in the series. In absolute terms there have been Test centuries scored with a higher strike rate, and indeed two of those were by another West Indian opener, Chris Gayle, one against Australia, also at Perth, and one against England. Fredericks did slow down a little in his innings, and Gayle took just one fewer delivery, 70, to get to his century, but with the greatest of respect to them Doug Bollinger, Mitch Johnson, Nathan Hauritz, Shane Watson and Clint McKay were rather less imposing than Lillee, Thomson, Walker, Gilmour and Mallett. Against England, at the Oval in 2004, Gayle needed 80 deliveries to bring up his hundred. As to the quality of Fredericks’ innings it seems to that everyone save a few of the Australian players recognised its brilliance. In his autobiography Lillee barely mentions the game in passing. Greg Chappell deals with the match at rather greater length, but his verdict was simply that Australia played as poorly as any team I’d ever been involved with. Lloyd of course took a different view, writing that the innings contained some of the most exciting strokes I have ever witnessed. Mallett, the one Australian bowler who couldn’t have bounced Fredericks even if he had wanted to, is a writer whose work I enjoy, and his prose is seldom grandiloquent, but on this subject he made an exception, writing of the day all the stars in the firmament got together with a dynamo to give the world of cricket an unmatched heavenly delight. Fredericks was 33 when he produced his great innings, and there were only a couple of years left at the top, but they were very successful ones. After the Australian disappointment he averaged 40 against India at home in that controversial series when so many Indians were injured. After that it was to England again for the long hot summer of 1976 and Tony Greig’s faux pas. Fredericks averaged more than 57, and scored two centuries and three fifties. The hundreds were important innings too, as in all probability without them West Indies would have lost both matches, which would have allowed England to escape with a drawn series. There were a couple of ducks as well, mistimed hooks both, but for Fredericks, as for all batsmen who play the riskiest shot in the coaching manual, that was an occupational hazard. That winter Fredericks played his final Tests, a five Test series against Pakistan in the Caribbean. He went out in style too, a century and four fifties for an average of 50.77 in a contest that West Indies won 2-1. By then Fredericks was nearly 35, and not surprisingly he chose to sign for Kerry Packer’s World Series Cricket. The style didn’t change, and he still eschewed a helmet or other protection beyond the traditional pads, gloves and box. He wasn’t an outstanding success, but still averaged 34.50, and rarely failed. By the time the Packer schism was over a man of Fredericks’ age was never going to displace Desi Haynes, and what looked for all the world as if it was going to be his last season, 1979/80, was disappointing anyway. So he slipped quietly out of the game, to become a squash player of considerable ability. By then he was also a junior minister in the controversial and dictatorial regime led by Forbes Burnham that governed Guyana. He had special responsibility for sport and youth affairs. And then a funny thing happened in February 1982. Guyana hadn’t won the West Indies domestic First Class tournament, then known as the Shell Shield, for the best part of a decade. The government decided to make a contribution and Fredericks made himself available for the last two matches. Maybe all that squash was good for an opening batsman, as Fredericks only visit to the crease in the first game brought him 103 as Trinidad and Tobago were beaten comfortably. The final match was an innings victory over Jamaica that clinched the title. Fredericks contribution was the small matter of 217. There can be no better way for an old opener to leave the crease – two matchwinning innings from the top of the order, and a title to go with them. Wisely Fredericks did not seek to repeat the glories of 1982 and that double century against Jamaica was his final act in the First Class game and he went back to government and, particularly coaching and other cricket-related responsibilities. He was diagnosed with throat cancer in 1998. Surgery in New York seemed to be successful, and it caused shock waves throughout Guyana and the wider Caribbean when he died on 5 September 2000. Despite his links to the old authoritarian regime, and the fact that he had left the country for the US, Guyana gave Fredericks a very public display of respect. The funeral of the man who, twenty years earlier, Lloyd had described as in my view one of the best opening batsmen we have ever possessed took place at the Anglican Cathedral in Georgetown, and his casket was taken to the Georgetown Cricket Club at Bourda for public viewing, and was also driven round the outfield at another of Fredericks’ old stamping grounds, the Demerara Cricket Club. Also famous for giving the two fingered salute to Lenny Pascoe during a WSC match. Was such a good player to watch. Top read as always Fred.